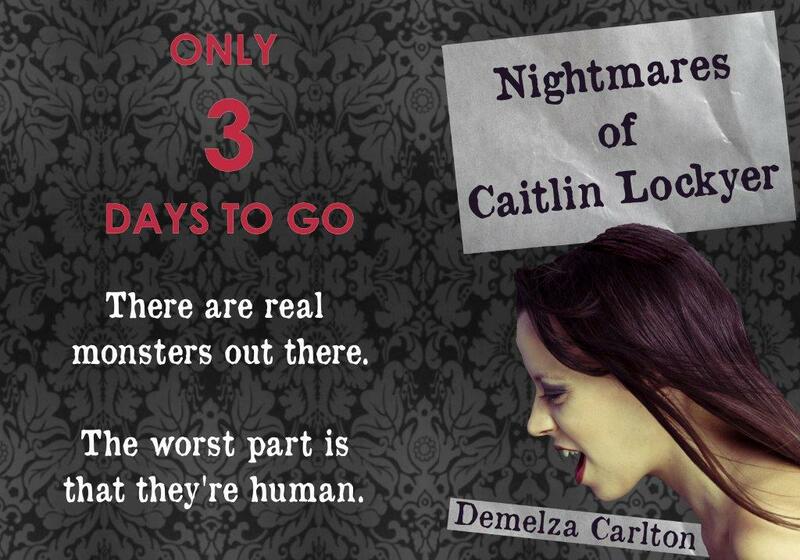 Less than three days left – and I have another excerpt of Nightmares of Caitlin Lockyer for you. “Go away – leave me alone!” Caitlin cried in panic. I woke with a shock in the middle of the night. She was screaming and struggling to get away from someone – but there was no one else here. I sat on the edge of her bed and shook her gently, but she didn’t wake up. She was locked in a deadly struggle with the people in her nightmare. She screamed abuse at me as I panicked and let go of her. There was nothing I could do. Gradually, her struggles gave way to helpless tears. “Please help me… you promised…” she whimpered. I tried to tell her I was here, that she was safe now, that there was nothing to worry about, because she was in the very best of care, but she kept going like she never heard a word of it. Her whispered, desperate pleas continued as I pressed the button to bring a nurse. It felt like forever before a nurse arrived. The nurse entered the room and sized me up, her look openly curious. At another time, I might have found her obvious approval gratifying. I know I would have liked what I saw. I would have responded by verbalising the invitation in her eyes. Maybe I should have. I know I wanted to. All those fleeting thoughts dissolved in my irritation that her attention was on me instead of Caitlin, whose sobs made my chest ache in sympathy. “I see.” I kept my voice equally flat. “Who’s she talking to?” the nurse asked. “Me. She wants me to help her.” It came out bitter. Because I couldn’t stop her nightmares. The nurse looked like she wanted to ask something else, but I didn’t want to explore this any further. I let my eyes wander over her body. When I lifted my eyes to her face, I gave her a look that plainly said, “Damn, not bad.” I hated myself for raising her expectations, knowing I was only going to dash them again in moments. She looked flustered, and I took the opportunity to get rid of her. “If there’s nothing you can do for her, then I guess you’re better off going back to the nurses’ station, or wherever else you’re needed.” I flashed her my most charming smile, feeling cheap for not following it up with anything else. “Go to tea, Carol.” Which Carol did, without hesitation. I stayed by Caitlin, where I promised I’d be, Nurse Carol’s words running through my head. She won’t be waking up for a while. Caitlin wouldn’t miss me if I went downstairs for a few minutes. Not if she wasn’t waking up for a while. I’d be back before she woke up. Perhaps I could make up for my curt dismissal of Nurse Carol and offer to pay for her tea. “No… please… don’t leave me!” Caitlin’s voice grew louder and more panicked with each word. “You promised!” Swearing softly, I sat down beside her again and she was silent. Swearing a bit more, I realised there was only one way I was going to get any more sleep tonight. I grabbed a sheet and pillow from my bed and carefully cocooned her body in her own sheet. I squeezed in behind her, so I was half under her pillow and up against the headboard. If she hadn’t been so small, I wouldn’t have fitted. So, I didn’t get to have a drink with Nurse Carol, but I got the consolation of sleeping with Caitlin. Ah, who was I kidding? It was a bloody nightmare. For those who can’t wait until the paperback is out…the ebook is on sale at Amazon for 99c while the countdown is on.